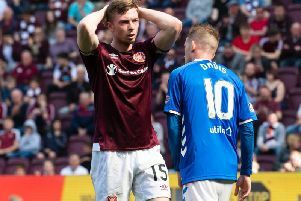 Hearts face a selection crisis for Sunday’s final Ladbrokes Premiership encounter at Kilmarnock after losing several players to injury and suspension. Danny Amankwaa, Demetri Mitchell and Joaquim Adao drop out of the side that beat Hibernian through injury while Kyle Lafferty is a doubt with a shoulder injury. Christophe Berra, Steven Naismith and Michael Smith are suspended.